John Lewis, regularly voted the UK’s favourite retailer, began trading in 1864 with the opening of our first shop in London’s Oxford Street. Since then we have succeeded in becoming the largest multi-channel retailer in the UK, with 35 John Lewis shops and a first class online business johnlewis.com which stocks more than 200,000 lines and is consistently ranked one of the top online shopping destinations in the UK. At Waitrose, we combine the convenience of a supermarket with the expertise and service of a specialist shop. Above all we take pride in the freshness and quality of our food. 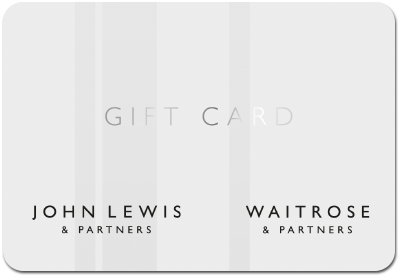 The John Lewis Partnership e-gift card can be redeemed in John Lewis or Waitrose shops and online at johnlewis.com or waitrose.com as part or full payment for goods (exclusions apply). Protect your e-gift card and treat it as cash; lost, stolen or damaged cards will not be replaced, or exchanged for physical gift cards or cash. This e-gift card will expire on the date shown, or 24 months from last use. Making a purchase or a balance enquiry refreshes the 24-month expiry period. This e-gift card cannot be exchanged for cash. No change or refund will be given, except in accordance with your statutory rights. Any balance remaining on the card may be applied to future purchases, provided the card has not expired. The card cannot be used to discharge indebtedness in respect of an account card or credit card issued by John Lewis plc, Waitrose Limited or John Lewis Financial Services Limited, nor can it be used for the purchase either directly or indirectly of any financial product or service. For full terms and conditions and balance enquiries visit johnlewis.com/customer-services.